Hand Salute. This is used for training purposes only. The command is Hand, SALUTE, and it is done in two counts. On the command SALUTE, the individual raises the right hand smartly in the most direct manner while at the same time extending and joining the fingers. Keep the palm flat and facing the body. Place the thumb along the forefingers, keeping the palm flat and forming a straight line between the fingertips and elbows. Tilt the palm slightly toward the face. Hold the upper arm horizontal, slightly forward of the body and parallel to the ground. Ensure the tip of the middle finger touches the right front corner of the headdress. If wearing a nonbilled hat, ensure the middle finger touches the outside corner of the right eyebrow or the front corner of glasses. The rest of the body will remain at the position of attention. This is count one of the movement. To complete count two of the movement, bring the arm smoothly and smartly downward, retracing the path used to raise the arm. Cup the hand as it passes the waist, and return to the position of attention. 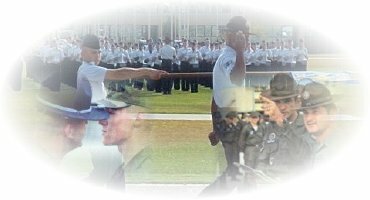 Outdoors, salutes are exchanged upon recognition between officers and warrant officers and between officers or warrant officers and cadets or enlisted members of the Armed Forces. Saluting outdoors means salutes are exchanged when the persons involved are outside a building. For example, if a person is on a porch, a covered sidewalk, a bus stop, a covered or open entryway, or a reviewing stand, the salute will be exchanged with a person on the sidewalk outside the structure or with a person approaching or in the same structure. This applies both on and off military installations. The junior member should initiate the salute in time to allow the senior officer to return it. To prescribe an exact distance for all circumstances is not practical, but good judgment indicates when salutes should be exchanged. A superior carrying articles in both hands need not return the salute, but he or she should nod in return or verbally acknowledge the salute. If the junior member is carrying articles in both hands, verbal greetings should be exchanged. Also, use these procedures when greeting an officer of a friendly foreign nation. Indoors, except formal reporting, salutes are not rendered. 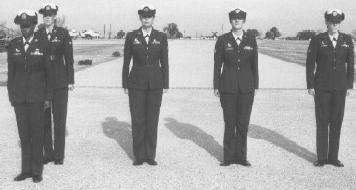 In formation, members do not salute or return a salute unless given the command to do so. Normally the person in charge salutes and acknowledges salutes for the whole formation. In groups, but not in formation, when a senior officer approaches, the first individual noticing the officer calls the group to attention. All members face the officer and salute. If the officer addresses an individual or the group, all remain at attention (unless otherwise ordered) until the end of the conversation, at which time they salute the officer. In public gatherings, such as sporting events, meetings, or when a salute would be inappropriate or impractical, salutes between individuals need not be rendered. Exchange of salutes between military pedestrians (including gate sentries) and officers in moving military vehicles are not mandatory. However, when officer passengers are readily identifiable (for example, officers in appropriately marked vehicles), the salute must be rendered. Persons in uniform may salute civilians. The President of the United States, as Commander in Chief of the Armed Forces, is always accorded the honor of a salute. Also, if the exchange of salutes is otherwise appropriate, exchanging salutes upon recognition is customary for military members in civilian clothes. Prisoners whose sentences include punitive discharges do not render the salute. All other prisoners, despite custody or grade, render the prescribed salute unless under armed guard. 3.6.9. In a work detail, individual workers do not salute. The person in charge salutes for the entire detail. In a work detail, individual workers do not salute. The person in charge salutes for the entire detail. 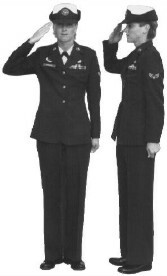 Any airman, NCO, or officer recognizing a need to salute or a need to return one may do so anywhere anytime. The commands are Present, ARMS and Order ARMS. On the command Present, ARMS, the airman executes the first count of hand salute. Count two of hand salute is performed when given the command Order, ARMS. The commands are Eyes, RIGHT (LEFT) and Ready, FRONT. These commands may be given at a halt or while marching. 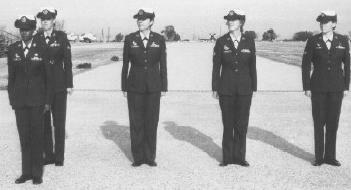 The preparatory command and command of execution are given on the right (left) foot while marching. On the command RIGHT (LEFT), all persons, except those on the right (left) flank, turn their heads and eyes smartly 45 degrees to the right (left). To return their heads and eyes to the front, the command Ready, FRONT is given as the left (right) foot strikes the ground. On the command FRONT, heads and eyes are turned smartly to the front. During parade, flight commander gives commands with a delay of three steps between the preparatory and command of execution. On the preparatory command Eyes (given approximately six paces from the reviewing stand), the guide raises the guidon straight up. On the command of execution RIGHT, the guide lowers the guidon to the horizontal position; at which time, everyone except the fourth element, turns head and eyes 45 degrees to the right as the left heel strikes the ground. On the preparatory command Ready, (given when the last rank is at least six paces past the reviewing stand), the guide raises the guidon straight up. On the command of execution FRONT, the guide lowers the guidon to the carry position: at which time, everyone with head and eyes to the right turns them back to the front as the right heel strikes the ground.